This is not about his writing or editing talents. He should understand that we are not challenging his writing or editing abilities. He is a good writer and editor, and can write and edit any number of books that will be both useful and beneficial to the world. This is not an issue for mere scholarly debate; this is a sacred issue, the very heart of our Guru Maharaja. His books are his heart, his gift to the world; they should not be criticized, decimated, undervalued or above all, changed to suit the tastes of scholars or revisionists. To even consider doing so betrays the consciousness of I am on the same level as my guru; I can improve his work, and I can even do better.’ This is a dangerous position. Srila Prabhupada worked closely with his editor Hayagriva on Bhagavad-gita As It Is from 1966 through 1968. Hayagriva worked with Srila Prabhupada in New York in 1966. He came from New York to San Francisco in late 1966 or early 1967 to continue working with Srila Prabhupada at the San Francisco temple. Hayagriva was already at the San Francisco temple when I first met Srila Prabhupada in early 1967. A year later, in early 1968 my husband and I were living in Los Angeles with Srila Prabhupada. His Gita was soon to be published by Macmillan. I worked on the cover picture for the Gita, which originally was a detailed drawing of the virat-rupa (universal form) of the Lord, with many arms and Arjuna kneeling beside Him. This is what Srila Prabhupada wanted. In spring 1968, we flew to New York with Srila Prabhupada. We met with the publishers and editors at the Macmillan office to discuss the cover art and submit the cover picture. Cover art is a late step in the production of a book. This means that the unabridged Bhagavad-gita was already complete and ready to go to press in late 1967 or early 1968. We were in negotiations with Macmillan about the size and content of the book. During the negotiations, Macmillan explained that they felt there was too much repetition in the book, and they wanted to cut down the purports. Macmillan was paying the cost of publishing, so they had the final say. Srila Prabhupada was not happy with this proposal, but he wanted to get his book in print, so he agreed to it. He hoped to get the complete book in print later. The fact that the abridged edition sold well demonstrated a viable market for the book. Thus in 1972, Macmillan printed Srila Prabhupada ‘s full, unabridged edition of Bhagavad-gita As It Is. Therefore, it was not Hayagriva, but Macmillan who was responsible for cutting down the size of the book. They also changed the cover art to a solitary four-armed form of Visnu. Macmillan, not Hayagriva, edited the abridged edition from the original complete edition. This all took place by mid-1968. So actually, Srila Prabhupada’s unabridged Bhagavad-gita As It Is – later published in 1972 – was already complete by early 1968. If Macmillan had agreed to publish it then, the unabridged edition would have gone to press in early 1968 – before Jayadvaita Maharaja became a devotee around mid-1968. My point is that all the editorial decisions for Bhagavad-gita As It Is must have been made before Jayadvaita Maharaja even joined ISKCON. Therefore, Jayadvaita Maharaja cannot possibly know the extent of Srila Prabhupada’s and Hayagriva’s collaboration on Bhagavad-gita As It Is. For example, how can we think that, as Jayadvaita Maharaja asserts, Hayagriva chose the phrase the Blessed Lord said’ independently from Srila Prabhupada’s instructions? In the early days of the movement, we were like a close family. We personally discussed everything with our spiritual master, Srila Prabhupada. Every detail of every book was personally directed and overseen by Srila Prabhupada. As some devotees know, I was Srila Prabhupada’s secretary and servant from late 1967 to early 1969. My husband and I lived and traveled with Srila Prabhupada extensively during that time. While with Srila Prabhupada in early 1968, I did the cover drawing for the first Macmillan Gita, the small blue-violet edition. We were living in a large apartment in LA, and Srila Prabhupada would come shuffling down the hall in his house slippers and into my art room, look over my shoulder at the work in progress, and offer many suggestions. He oversaw my drawings for Teachings of Lord Caitanya at that time also. He described in detail, for example, how the interior of Jagannath Puri temple looked, how the priest was sitting on the edge of the altar receiving the garlands to offer to the Lord, how the lighting inside the temple room looked, etc. Srila Prabhupada personally described and watched over the development of each drawing. He conceived of each work in all its details, and we simply carried them out according to his instructions. Srila Prabhupada worked very closely with his editors and artists on his books. In late 1968 we were living in Los Angeles in the Hayworth Street apartment with Srila Prabhupada. I was transcribing Nectar of Devotion and Caitanya-caritamrta. Hayagriva came to visit from the East Coast, stayed with us for several weeks and spent many hours working with Srila Prabhupada in his room. Srila Prabhupada certainly discussed every single facet and aspect of the editorial work with Hayagriva. I have many old notebooks filled with notes from my daily letter writing and editing sessions with Srila Prabhupada. It is likely that Hayagriva also filled notebooks during his editing sessions as well, and later incorporated these notes in editing Srila Prabhupada’s books. In those early days, there was no worldwide movement, no BBT, no sannyasis, no GBC, no money and no politics. There was simply lots and lots of spiritual love for Srila Prabhupada. He taught us that love is the basis, not ambition, achievement and accomplishment. It’s not what you do for Krsna, but how you do it – with what consciousness. There was just Srila Prabhupada and his family of devotees, and we worked on the books together. Srila Prabhupada certainly oversaw the specific details of the artwork, and he had plenty of time to oversee the writing and editing as well. My point here is that we are assuming a lot if we think that Srila Prabhupada didn’t know what was going on with his books. He was directly involved with supervising every aspect of book production, both externally and internally. There is an esoteric spiritual side of this – he was working through us willing disciples, empowering us with his Midas touch.’ His bhakti infused everything he touched, and we willing servants were simply vehicles for his mercy to shine through. We were not the doers; we were only Srila Prabhupada’s instruments. Our only qualification was our sincerity, and our simple desire to serve: not to become great ourselves, but to put forth the greatness of our guru. That was our driving desire. A writer usually prepares several working drafts before the final draft is polished and sent to press. For example, I made several drafts of this letter, correcting spelling, grammar and style. The first drafts are in my trash bin. I am signing this, the final draft, for publication. If someone took an earlier draft out of my trash bin and published it, I would be greatly annoyed. Similarly, Srila Prabhupada’s signature is on the final draft of the complete Bhagavad-gita As It Is (completed in 1968 but not published until 1972), not on any so-called original manuscripts’ Jayadvaita Maharaja may possess. To assume that Srila Prabhupada was not watching over and scrutinizing this whole process is absurd. His books were most important to him. He knew both internally and externally what was going into his books, and he signed and sealed the work when it was completed to his satisfaction and ready to go to press. Books go through several stages of editing on their way from first draft to being ready to go to press. Usually, different editors with appropriate backgrounds, qualifications and skill levels perform these different stages of editorial work. The original manuscripts’ excerpted on Jayadvaita Maharaja’s website defending his changes to Bhagavad-gita As It Is clearly have received spelling and grammatical edits. It is obvious to the trained eye of an experienced editor that they are ready for the next stage, the style edit. Srila Prabhupada engaged Hayagriva, a highly trained and qualified English writer, poet and editor, as a comprehension and style editor to give Bhagavad-gita As It Is a poetic, flowing, readable style acceptable to the widest audience as well as the most highly educated class of intelligent readers. Srila Prabhupada’s books were transcendental when he wrote, edited and approved them, and they became the foundation of his International Society for Krishna Consciousness. So how can anyone say that they aren’t transcendental now? He spoke from the original 1972 edition of Bhagavad-gita As It Is for over half a decade, giving hundreds of classes on nearly every verse and chapter. Srila Prabhupada infused his books with his pure bhakti. 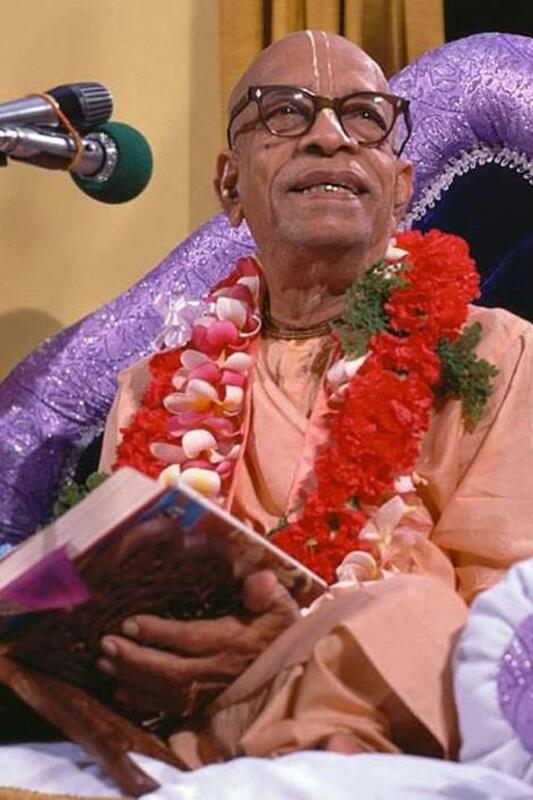 When Jayadvaita Maharaja presents his rationale for editing Srila Prabhupada ‘s Bhagavad-gita As It Is to the public, he quotes a few passages from Bhagavad-gita As It Is that are obviously confusing, and claims, “these need to be changed.” For example, he cites “planet of the trees” [Bg. 1972 edition 10.24 P] and “cattle raising” [Bg. 1972 edition 18.44 T]. He uses these isolated examples to justify his wholesale rewriting of the entire Gita. Perhaps no one would object if Jayadvaita Maharaja had noted those few changes authorized by Srila Prabhupada in footnotes or an addendum, instead of making sweeping, unauthorized editorial changes to virtually the entire book. If he feels there are confusing aspects, or as he himself is fond of putting it, “goofs” in Srila Prabhupada’s Bhagavad-gita As It Is, then these portions can be selected and clarified in a published addendum or series of footnotes without changing the meaning of any other part of the book. Krsna sent Srila Prabhupada an army – perhaps it was an army of monkeys and bears, but each and every one was sent to Srila Prabhupada for a specific task or purpose. Hayagriva’s task was editing Bhagavad-gita and other books. He began work in 1966 and worked closely with Srila Prabhupada through 1968. My tasks were different. I was in my fourth year of college when I met Srila Prabhupada, so perhaps I was materially qualified to edit Srila Prabhupada’s books, but that was not the job given to me. Srila Prabhupada had already chosen his Bhagavad-gita editor: Hayagriva. I was given other tasks, to illustrate the cover of the first Macmillan Gita, the early Back to Godhead magazines and Teachings of Lord Caitanya. In 1968 and 1969, I served Srila Prabhupada by transcribing Nectar of Devotion and Caitanya-caritamrta. I also served by taking daily dictation for his numerous letters during my time of being Srila Prabhupada’s servant and secretary from late 1967 to early 1969. It was not necessarily a question of mundane qualification. We were the army Krsna sent to Srila Prabhupada, and he, our General, used us according to his divine vision. Jayadvaita Maharaja was later engaged as a BBT editor, along with others, and Srila Prabhupada much appreciated his editing work. But this fact does not give him blanket authority or license to rewrite Srila Prabhupada’s Bhagavad-gita As It Is after his departure. Srila Prabhupada trusted me to transcribe and edit his letters daily, but I certainly don’t assume now that I have any right to go in and edit or change his letters! Therefore, once Srila Prabhupada was satisfied, he signed the letter or book, and at that point it must be seen as a finished work. No one should touch it. You may ask, “Shall we leave the typos?” but that’s not the issue. Jayadvaita Maharaja has rewritten the whole book according to some manuscripts that he believes to be the original – and which Srila Prabhupada did not choose to print. Rather, in both 1968 and 1972 Srila Prabhupada chose to print the edited version, not a manuscript. Not only was Jayadvaita Maharaja not given authority to edit Srila Prabhupada’s books, he also did not obtain the blessings of Srila Prabhupada ‘s disciples. Yes, the GBC did resolve by a one-vote margin to approve Jayadvaita Maharaja’s proposal to edit Bhagavad-gita As It Is. But what about the opinion of Srila Prabhupada’s disciples? The great majority of them either left or were pushed out of ISKCON in the years following Srila Prabhupada’s departure. Were they consulted? And when they discovered the massive changes to Srila Prabhupada’s Bhagavad-gita As It Is, many complained, but their voices were not heard or acknowledged. After Srila Prabhupada left in 1977, a decade of confusion ensued. Many mistakes were made and many wrongs committed. For all practical purposes, Srila Prabhupada was pushed aside. His books were then edited in this post-disappearance era, when the mood in ISKCON was, “We can do better than Srila Prabhupada.” Time has proven otherwise. How will history view this era? They will likely see it as the Dark Ages’ of ISKCON. Fifty years from now, all the players and characters will be dead and forgotten, even the big, important leaders.’ But Srila Prabhupada and his original books will remain as a beacon to light the path of human society for the next 10,000 years. Our duty as disciples of Srila Prabhupada is to see that his original words, his adi-vani, are not lost to time and to repeated changes by editors, as was the Bible. We must speak out – while we are still present in this world. For the future welfare of the world we must leave a wide mark so that historians will know for certain which of the editions of Bhagavad-gita As It Is was actually authorized by Srila Prabhupada. If one unauthorized edition can reach such a wide audience, how many future versions can we expect to be printed bearing Srila Prabhupada’s signature? Surely in a few years, someone will want to improve on Jayadvaita Maharaja’s edition, and so on and on. Once we open the door to post-disappearance changes, the flood of changes will occur and reoccur indefinitely. There will be no end to it. We must close this door now – in our lifetime. We who are inspired by Srila Prabhupada’s original books must speak out, so people in the future can clearly see what happened. Our greatest responsibility as disciples of Srila Prabhupada is to protect his original, authorized and approved books and ensure that they will be there to guide Humanity in this Kali Age. Either we correct this mess now, or history will correct it for us – with the loss of Srila Prabhupada’s original words, his adi-vani – forever. We have a duty to speak out for Srila Prabhupada’s books, for our guru. Like in the Battle of Kuruksetra, there are no neutral positions. This is no time for silence. Our silence indicates agreement. How can we, as disciples of Srila Prabhupada, agree with changing the very words that are Srila Prabhupada’s lasting presence on this earth? We must speak out, and we must be heard. This entry was posted in All posts, Arsa-prayoga, As remembered, BBTI, Bhagavad-gita As It Is, Govinda Dasi, Jayadvaita Swami, No authorization, Prabhupada said, Srimad Bhagavatam and tagged arsa-prayoga, authorization, bbt, BBTI, Bhagavad-gita, bhagavatam, blueprint, bowdlerizing, editing protocol, galley proofs, Govinda Dasi, Hayagriva, Jayadvaita, memories, posthumous editing, prabhupada. Bookmark the permalink.